This test of one dozen varieties of cold-tolerant hybrid wine grapes will provide the first research-based information about comparative hardiness and (later on) juice/wine quality for the NC High Country. The region’s late spring frosts and short growing season present unique challenges that must be overcome if local wineries are to be able to use local grapes as a supply. 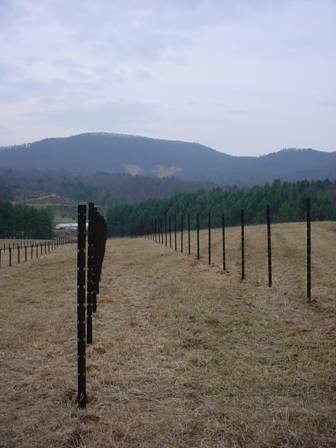 This project was proposed after I visited several sites in Alleghany County where vinifera and other insufficiently hardy wine grape varieties had been planted. 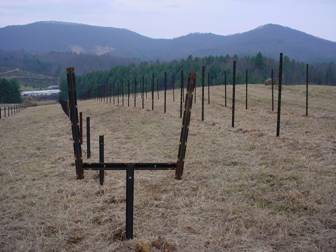 The growers who planted these vines had chosen varieties that thrive and produce in Yadkin County. Despite our relative proximity, these varieties either fail to thrive or winter-kill entirely in our higher elevations. Hopefully, the data generated by this project will aid all future wine grape growers in the region to avoid this costly mistake. It takes approximately $10,000 to plant an acre of grapevines, so it’s important to get it right the first time. Successful area growers were consulted at all phases of this project. Many of them had good experiences ordering from Double A Vineyards, so this supplier was chosen. A group of area wine grape growers offered input about varieties to include, and an order was placed in November of 2004. It was decided that a nearby supplier would be used for all trellising materials, as we hoped to build relationships with knowledgeable businesses that are within easy visiting distance. S&H Farm supply was chosen based upon its proximity, its stocking of appropriate supplies, and the technical support provided by owner Frank Hobson. His prices were competitive with larger but more distant suppliers, once the costs of shipping were factored into the equation. 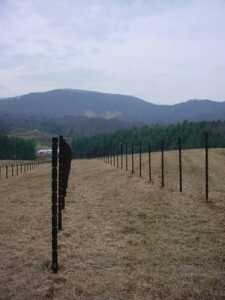 The vines will be planted in April of 2005, and will be tended and monitored for during upcoming years. Performance will be compared on two trellising systems: an open lyre-type of double curtain trellis, and a single-curtain VSP-type of trellis. Both present and potential wine grape growers are following our progress closely in the hopes that the project will offer insights that will prove helpful to growers choosing which varieties to plant o their own sites. The planting of these wine grapes will signify the very beginning of the real work of this project. The support of the Specialty Crops Program is what has made it possible to reach this point, and many growers, researchers, and neighbors are curious to learn of the results of the next 5-10 years. 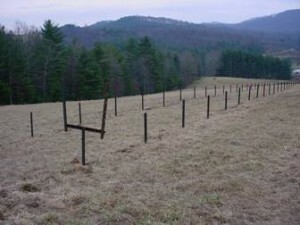 Photo 1 – The Lyre trellising erected at Upper Mountain Research Station in January 2005. It is thought that a properly-managed Double Curtain trellis allows for better air circulation, leading to decreased pressure. It also increases the photosynthetic surface area of the vines. However, it also requires a greater amount of management. Photo 2 – Another view of the Lyre trellises at the Upper Mountain Research Station. Only one of the upper halves of the trellises has been attached so far. It will be easier to plant the grapevines this April without them installed. The first wire will be strung on the lower halves of the trellises this summer, then the rest of the divided-curtain arms that comprise the upper halves will be installed after that. Photo 3: The VSP trellises erected in January 2005 at the Upper Mountain Research Station. It is thought that VSP single-curtain trellises are easier to properly prune and manage than double-curtain systems. Photo 4: Loading Posts – S&H- 0028 – 10’ x 6” Pressure-treated posts were chosen for the row ends, and purchased from S&H Farm Supply. 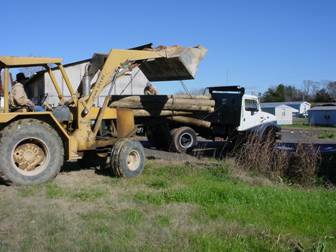 Here, they are being loaded into UMRS’ dump truck in December 2004.